Most Elon University students are right at the cusp of the age where they may never have purchased a vinyl record, ripped the plastic off, unwrapped the disc from its sleeve and physically put needle to the ridge. In an age of MP3s, CDs are almost extinct and cassettes are all but a memory. 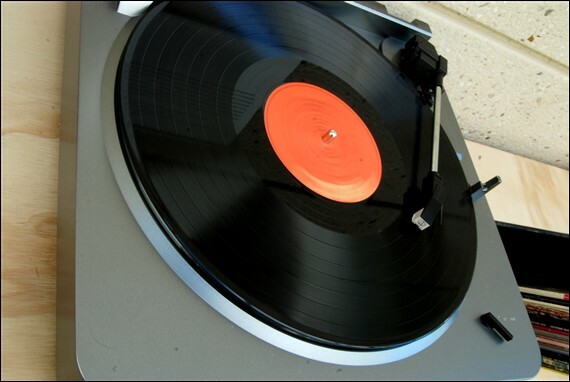 Yet, vinyl holds on as a subject of retro nostalgia and fascination. Those without a record player of their own may do well to visit the Nasher Museum of Art on Duke University’s campus in Durham. The current temporary exhibit is “The Record: Contemporary Art and Vinyl,” celebrating records as an art form and a means to creating art. The exhibit begins in the main lobby of the museum with a record tower several feet high, and remnants of records scattered around the base. Directly above the entrance to the exhibit hangs a boat made of red Victor records, and next to that is a listening station featuring records as diverse as the Beatles to J-Pop. But the real magic is inside the exhibit. One wall has recorded tracks of dogs barking, or birds singing — with displayed copies of the record with colors and titles correlating with the tracks. Another wall features an artist’s interpretation of a record label with cut-paper record sleeves of artists of his imagination. The artist, Dario Robleto also melted records into shirt buttons, sewing them on to thrift store shirts and re-donating them, as well as a model of a matchbox and sewing needle. The pieces in the exhibit range from the traditionally artistic, such as a large-scale painting of record jackets by Dave Muller, to folk art. “Mingering Mike” is the pseudonym of a man who grew up in Washington, D.C. who dreamed of being a soul singer. During his teenage years he created record sleeves for his imaginary career, which never lifted off the ground. Now his drawings and sketches are considered fine examples of United States folk art. Other pieces include videos of skipping records and still photos set to recorded music. The original Polaroid art from The Talking Head’s seminal album “More Songs About Buildings and Food” – a record that originally came out on vinyl – is on display as well. As the viewer exits the gallery, one of the last displays is by Japanese artist Taiyo Kimura. A five-minute video and audio loop portrays Kimura doing everything in his power to disrupt a record player – throwing an octopus on it, cutting an apple on it with a knife taped to his head and using a chicken leg as a second “needle.” Don’t be afraid to laugh – the display is intended to be humorous. The exhibit runs through Feb. 6, 2011 so there is plenty of time to make the trip to Durham. “The Record” takes those who may have missed the heyday of the vinyl record and reintroduces them to vintage and new uses of music recording.